Consumers believe that emerging technologies can make the world a better place. We are living in unprecedented times. Across the globe, divisiveness and threats to equality are tearing at the fabric of our society. At the same time, as we enter the Fourth Industrial Revolution, technology is fundamentally impacting every aspect of our entire lives — with the power to bring us either closer together or further apart. We're facing an inflection point, and we believe the tech industry has an urgent responsibility to help shape the future. We've seen it time and again in the news – Silicon Valley under scrutiny for creating agnostic platforms with unintended consequences. And likewise, we’ve seen the public hold these companies to account. At Salesforce, we recognize that technology is not inherently good or bad – it's what we do with it that matters. And there is no pretence that we have all the answers. In fact, earlier this year we had to hold a mirror up to ourselves and ask: what's our responsibility, are we living up to our values, and is our technology being used as a force for good? That's how we began on our journey to expanding our Equality Charter and creating our Office of Ethical and Humane Use. Our journey started with listening – first to our employees. Some voiced concerns about potential uses of our technology that they felt may not be aligned with our core value of equality. Salesforce is a company that was built on four core values (trust, innovation, growth, and equality) along with the idea that, as our co-CEO and Chairman Marc Benioff says, “The business of business is to improve the state of the world”. We believe that our higher purpose is to build a more equal world for all – recognizing that this must include the impact of our technologies. We convened multi-stakeholder dialogues with business leaders, academics, and society leaders to discuss how we could work together to chart a path forward. Shortly after we set out to gather data-driven insights. 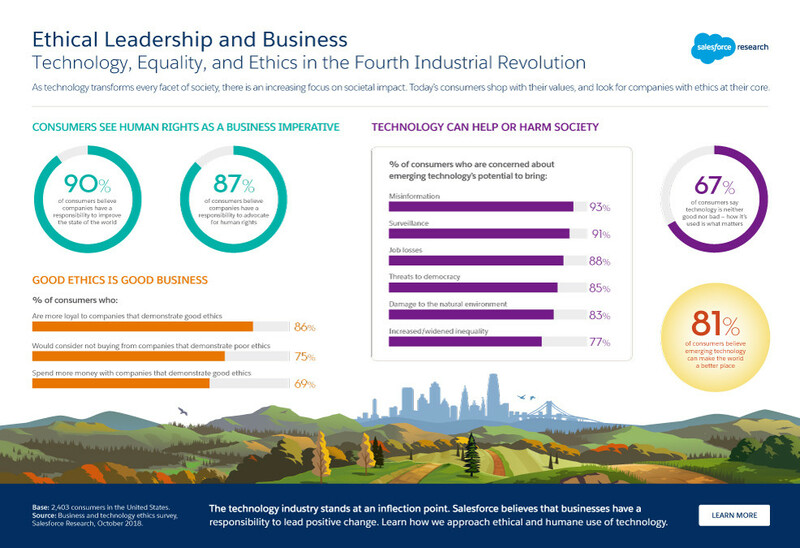 Salesforce Research surveyed more than 2,000 consumers in the US to better understand perceptions of the role of companies in society, ethical technology, and purpose-driven business. We found that consumers have real concerns around the potential harm technology can cause in areas such as privacy, misinformation, surveillance, job loss, environmental damage, and increased inequality. More than half (51%) say they are more worried about technology’s ethical issues than they were a year ago. At the same time, people are looking for businesses to lead the change – 93% of consumers believe companies have a responsibility to look beyond profit and positively impact society – and an overwhelming majority is optimistic about the future. 81% of consumers believe that emerging technologies can make the world a better place. The essential question is, how can the tech industry as a whole pivot and come together to ensure we are building technologies that are a force for good in humanity? In that spirit, we established our own advisory council and updated our human rights commitment – and we established an office to focus solely on these issues. Most recently, Salesforce hired our first-ever Chief Ethical and Humane Use Officer to lead our initiative helping develop and use our products in an ethical manner that upholds the basic human rights of every individual. It's early in our journey and we know there is much more to learn. We are are committed to approaching everything with a beginner's mind, listening to our stakeholders, and living our values to ensure our technology is a force for good. We're at a critical moment in history, with big opportunity for the tech industry to come together to build a better world. We can't turn our back on this — the only way is a united path forward.